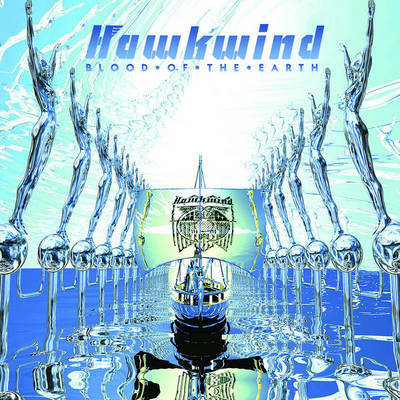 Hawkwind - "Blood of the Earth"
Hawkwind is back with their first new studio CD in 5 years and this time it is also released on vinyl by Back on Black records. On the CD edition you get an extra bonus track that is not on the vinyl and vice versa, so you need both the double CD edition and the vinyl to get all the new music. Most of the material on the second CD is live stuff including a killer version of Angels of Death and a strange interview collage. The small box and the double CD packaging are really fantastic. It is the first studio material with Tim Blake, Mr Dibs (Spacehead) and Niall (Tribe of Cro). As is the tradition with Hawkwind they always seem to rework older tracks and here we have a new version of You Better Believe It and a track from Dave Brock's first solo record, Sweet Obsession. The LP starts off with a pretty cool mostly instrumental track called Seahawks. Dave does a few spoken word like vocals. A really nice sound but the low end is a bit too much in the mix and unless I adjusted the subwoofer it really sounded muddy. Bad mastering or no mastering? There are no credits on the LP about mastering. Anyway, a very cool and heavy track. The title track is next and features Mathew Wright on spoken word, where he sounds a lot like Dave. It is a new age ambient thing with waves of sound and things flowing through the mix. Very spaced out. Wraith is a Mr. Dibs track and could have been lifted from one of the Spacehead CDs but is still a very good high energy psychedelic space rock track with a nice solo by Mr. Blake. Side B starts with Green Machine, another ambient mainly synth space out piece. I am pretty sure Tim Blake was the major influence on this one as the synths have that new age feel of his solo stuff. There is a very nice guitar solo in this instrumental piece. Dave or Niall? Inner Visions has a bit of a mid eastern feel to it and is a very cool piece of music with some nice lyrics as well. Is that Tim or Richard on vocals? It is not Dibs or Dave? This track would be much better if it had real pounding rock drums as the programmed and maybe real drums are so thin and weak. This is track 5 on the record and only mainly real drums on one track so far. Still, I like the very psychedelic track. The left channel is very spaced out at times. Sweet Obsession, originally on Dave Brock's Earthed to the Ground solo record is next and a much slicker processed version with a more complex instrumentation but the overall melody is the same. This would be the track they would send to the radio, if any. Again, the drum track is so thin and processed. A very nice bass line and great Dave Brock singing. He is way better than any of the other guys and still sings just like he did 40 years ago! Amazing voice. Side 3 starts with Comfy Chair an interesting and mellow psychedelic track with some violin keyboards (no one is credited with playing violin) and Dave on spoken words. This track builds up in a really wonderful way and leads into Prometheus. Dibs sings this one and it is a track that slowly builds up and is quite psychedelic. The main lead guitar line is very nice as well. The middle section is a strange piece with sampled sitar and multiple guitars layered and then the synths come in as well. The new version of You'd Better Believe It ends side 3. It is not as good as the original (especially the poor drum sound) but it is nice to see them psych out in a totally different way than the original. Side 4 is the totally mellow laid back side to send you off to bed. It starts with the track Sentinel which is another ambient space track but with some beautiful Dave Brock guitar, laid back Dibs vocal and real drums! Starshine is a long track recorded with the late Jason Stuart, for whom this record is dedicated. If you were at the 40th anniversary show or managed to get the free CD that was given away at the show, you have heard this laid back track featuring Jason on keyboards. The bonus track on the LP version is Sunship and a short track again sung by Dibs, not all that dissimilar to the Starshine track, at least the way it is sung. Nice bass lines. That is all for the new Hawkwind record. Nice, laid back, psychedelic. That is the overall description. I hope they make a "real" rock record next time.